You are cordially invited to meet with Former Lord Mayor of Dublin, Cllr. 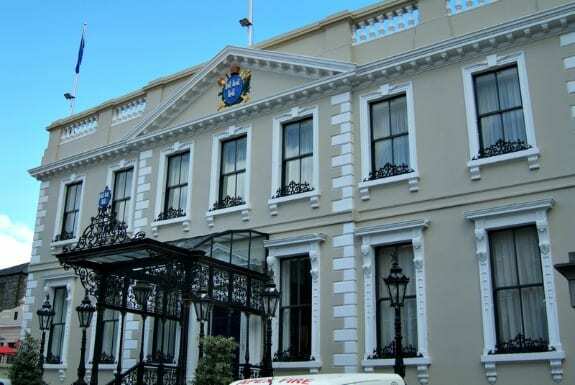 Andrew Montague for tea at The Mansion House, the official residence of Dublin’s first citizen. Learn about the Mayoral office and its historic connection with the Mansion House. The Mansion House is said to be haunted and the Lord Mayor himself has witnessed the ghostly happenings first hand while living in this famous house. The Mansion House is one of Dublin’s finest and most loved buildings and has been at the heart of city government since 1715. Original construction started on the project in 1705, and was intended as a townhouse for Joshua Dawson, the developer of Dawson Street and Nassau Street. Joshua Dawson seldom lived in the house. Ten years later and still partly unfinished, it was sold to Dublin Corporation for £3,500 (€4,444), in addition to an annual rent of 40 shillings and an agreement to provide a loaf of double refined sugar, weighing six pounds at Christmas. The Mansion House’s most famous features include the “Round Room”, where the First Dáil assembled on 21 January 1919 to proclaim the Irish Declaration of Independence. On 21 January 1969 a special fiftieth anniversary joint session of Dáil Éireann and Seanad Éireann assembled there and was addressed by the then President of Ireland, Éamon de Valera. The first Dáil met in the Mansion House Round Room in 1919 and cabinet meetings of that Dáil were held in the Dining Room. The invitation to tea with the former Lord Mayor of Dublin is limited to 30 people.